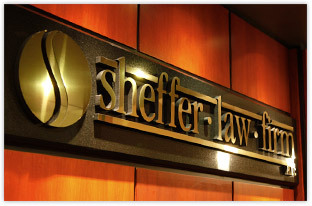 Sheffer Law Firm was established in 1982 by Ronnie Sheffer. Ronnie opened the law firm's first office in Henderson, Kentucky and expanded the practice from there. What began as a one city law office now expands the entire state of Kentucky and beyond. Our attorneys represent clients throughout Kentucky, Indiana, Ohio and Tennessee. We handle a variety of cases from medical malpractice and products liability to personal injury and premises liability. Over the past 30 years, businesses and individuals have sought our help and advice. They've hired us to handles claims of all types and sizes. Simply put, we are highly skilled and successful at achieving positive results for our clients. From the moment you call us or walk through our front door you will see that everyone at Sheffer Law Firm is professional, courteous and attentive. We know that your legal matter is very important to you. These matters can also cause you great concern and even anxiety. Rest assured, you are in good hands with Sheffer Law Firm. Everyone in our office is committed to you. Our entire team has years of knowledge and experience in numerous areas of law. We will put this knowledge and experience to work for you.